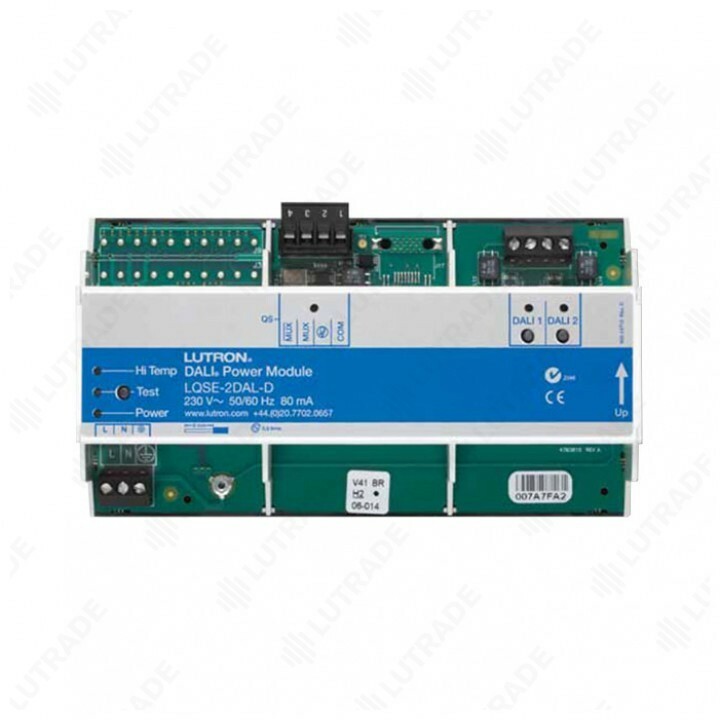 The DALI Power Module is a DIN-rail mounted controller for DALI-compliant digital addressable loads, referred to as control gear. It provides DALI bus power and control for two independent DALI buses with up to 64 DALI-compliant digital addressable loads each. • Power failure memory retains programming in the event of a power loss. • DALI Power Module can be used in a HomeWorks QS system to control and manage light in an entire home or building. • Lightning strike protection meets ANSI/IEEE standard 62.31-1980. Can withstand voltage surges of up to 6000 V~ and current surges of up to 3000 A. 250 mA maximum supply current per bus. • DALI-2 Certified; Compatible with DALI control gear (e.g. LED drivers). • The LQSE-2DAL-D is a single master controller and therefore no other controllers may exist on the same DALI bus. • Surrounding Air Temperature Range: 0 ?C to 65 ?C (32 ?F to 149 ?F). • Mount in a Lutron DIN Panel (see spec 369788) or in an IP20 (minimum) rated consumer panel or breaker panel with integrated DIN rail. • Width = 9 DIN modules (161.7 mm or 6 3?8 in). 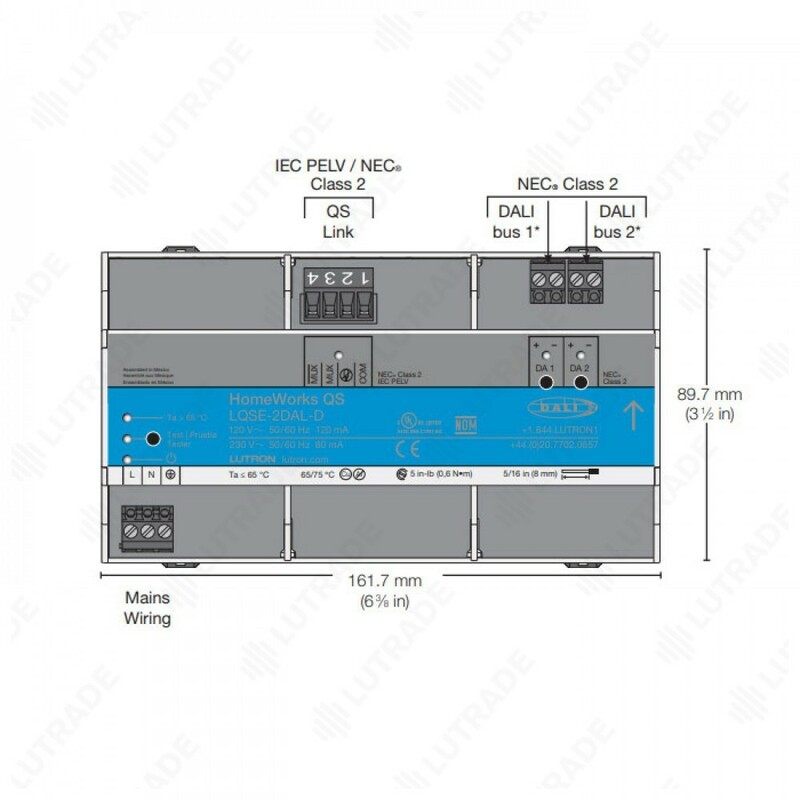 • For more information on mounting and installation in panels with integrated DIN rail see Lutron P/N 048466 at www.lutron.com. • The LQSE-2DAL-D can only be used with the HomeWorks QS system. • Setup and programming of the DALI Power Module is done through the HomeWorks QS programming software. • Up to 64 DALI compliant loads on each bus can be addressed and grouped into 16 zones. • DALI Power Module supplies a maximum of 250 mA to power each bus. • DALI Power Module supplies a guaranteed current of 128 mA to power each bus. 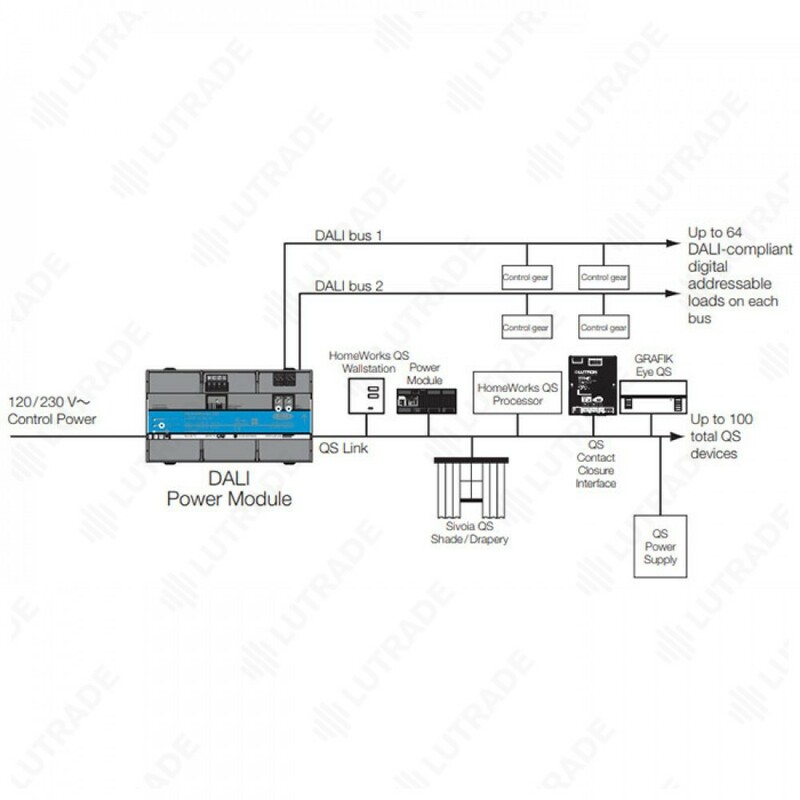 • DALI Power Module has an integrated bus power supply with polarity indicated on the unit. • Some DALI loads may be polarity sensitive. 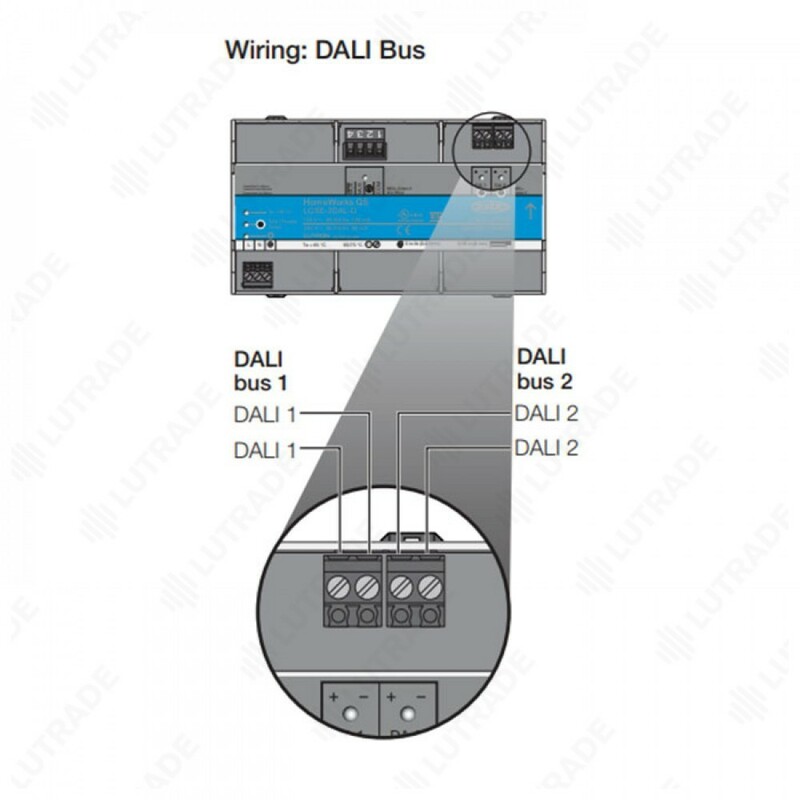 Refer to individual manufacturers' specifications for proper connection to the DALI bus. • Short circuit protection with automatic restart. 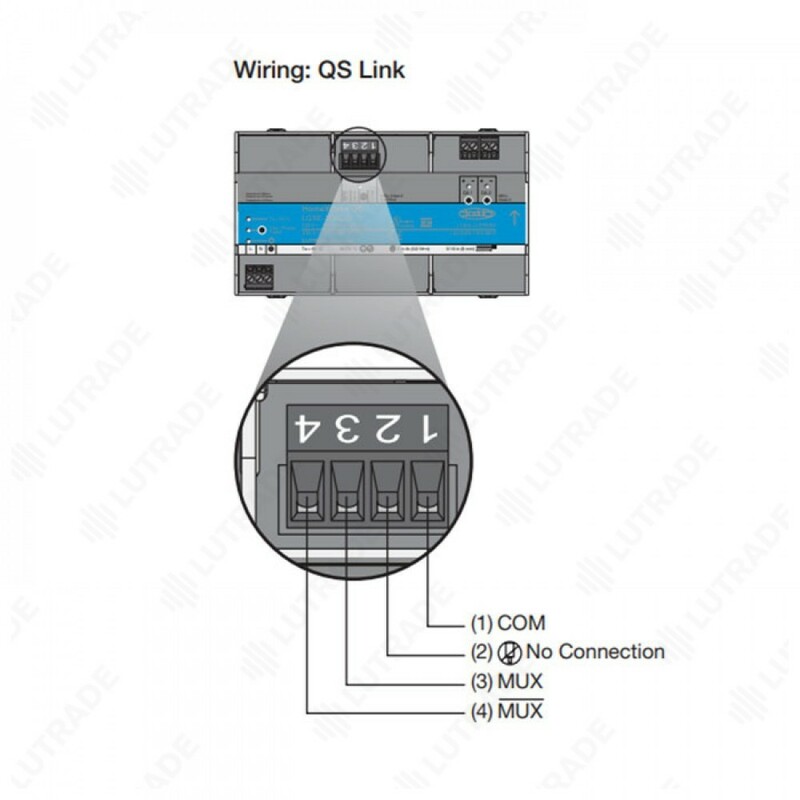 • A QS link in a HomeWorks QS system can have up to 512 zones (outputs) and 100 devices. A DALI compliant digital addressable load counts as 1 zone unless specifically grouped into zones from the HomeWorks QS software. • Each DALI Power Module counts as one device toward the 100 device limit. • A maximum of 8 fully loaded DALI buses may be connected to a single QS link. • HomeWorks QS wallstations can be configured to control DALI Power Modules with the HomeWorks QS programming utility. • Maintains redundant memory of control gear programming for ease of single or multiple control gear replacement. – Enter Test Mode: Press and hold Test button on the DALI Power Module until the Test LED starts flashing. – Test: Each press of either the DALI 1 or DALI 2 button will cycle the lights between high-end, low-end, flash and off for that bus. – Exit Test Mode: Press and hold Test button until Test LED stops flashing.